Wow! That is a long post title! A few weeks ago I reviewed the Tommie Copper Women's Compression Core Band and the Tommie Copper Women's Comfort Back Brace and the company was very generous to give away 2 of each of those garments to 4 different women who won those giveaway contests. Well, today, we are featuring my husband, whom I refer to as The Captain, because he has been wearing and testing the men's counterparts of these products for the past couple of weeks. And we are going to be hosting a giveaway for one of each... so read on! The Men's Comfort Back Brace is a taller version of the women's... makes sense as most men are longer through the torso than women are. 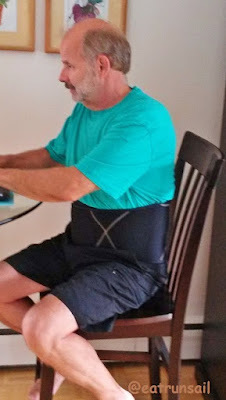 The Captain has been wearing the back brace during long periods of sitting at his computer, and also for doing strength workouts... particularly while lifting and doing planks. He is actually better about remembering to wear it than I am about mine. And darn, his posture is better than mine too! 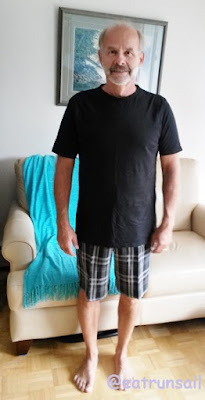 It is a very easy garment to get in and out of... it opens completely and then you just fold one end over the other, in front... there is a lot of room for custom fitting... and he has been taking care not to make it too snug. After all, you want your back and core to be supported, but you don't want them to have so much support that they don't do any work at all! It can be worn over clothing for quick on-and-off, or underneath if you prefer to hide it. The Captain said he would loved to have one of these Comfort Back Braces when he was still an active carpenter... it would have been a great help with all the lifting and toting materials around the job sites. Actually it would be great for anyone who does any kind of manual labor... or gardening, too. The Recovery Compression Core Band is quite different from the women's model. It is made to be worn around the middle so it is shorter, and it is also thicker. 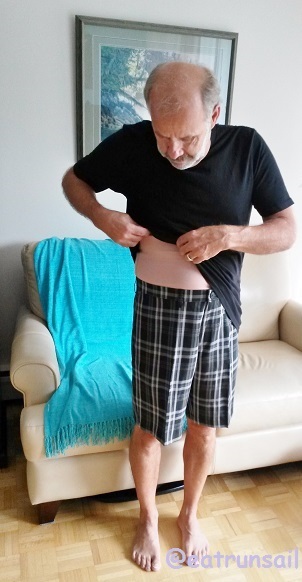 But it still hides nicely under a shirt and it is really handy to have for back and core support while away from home when you don't want it to be seen... long periods of sitting in concerts perhaps? It is also great to wear for after-workout recovery when the muscles are sore and tired. The Cool Copper fabric has moisture wicking properties and also eliminates odors. Nice. 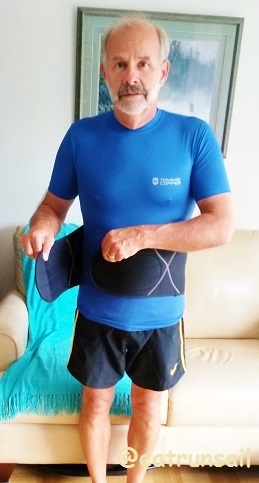 The Captain says he will likely wear this Recovery Compression Core Band when we get back on the golf trail this Fall. He loves to keep his back very warm while golfing... with all the twisting and turning... and with the band, he will be able to avoid sweaters and vests till well into the late season. If you would like to win one or both of these garments for yourself or a man in your life, enter the giveaways through the Rafflecopter forms below. The prizes will be supplied directly to the winners by Tommie Copper... and you can have an address in Canada or the U.S.A. to qualify. Good luck to you! The giveaways will run till 11:59 p.m. September 14th and winners will be named on the Rafflecopter forms and emailed the next day. The giveaway is over and the winners have been notified. a Rafflecopter giveaway a Rafflecopter giveaway Be sure to check out both of these great products on the Tommie Copper web site for yourself. If you are in Canada, you will be directed to a Canadian site where you can purchase these items. The Captain was given these products but the opinons are his alone. MY CAPTAIN, err husband needs this so much. Oh Captain! He looks so great in it! I would never guess he was wearing one. My mom wears something like this!! She says it helps, so hey, what ever works for you, right?! I would give it to my bf. The Captain is such a good-natured model! Glad you are sharing your swag with him! Ooh! My husband would love this! Great post! I love seeing photos of people actually using the products - it makes it so much easier to envision how they work. I've never seen a core compression band before but can picture that being really useful. Thanks for sharing!! Another option for compression and recovery. That's awesome! This sounds like a great solution for those who experience back pain. My mother definitely needs this. Thanks so much for sharing. My dad could definitely use the brace for work- he's constantly on the move and has to be careful due to a previous back injury! My husband and his bad back would LOVE this! one of my runners on my team uses tommie copper and keeps recommending it to me for my shins...I'll have to look into some calf sleeves! I love my Tommie Copper calf sleeves. This looks like another great product by them. I would love to have this.. I am a larger woman and tall, so this would be great for my back issues! I'm treating some lower back problems, and core work is part of the package... extra compression would be welcome! I would give it to my hubby, who has back issues, and does a lot of work outside. I would keep it and hope it helps my posture. I would give it to my husband who has been dealing with some back problems that he's trying to ignore.